Torch Boots Mod 1.12.2/1.11.2 has added only one special and useful item named Torch Boot in Minecraft. If you have ever run into the darkness or gotten bored when marking the directions at night, please continue this article. From now, those sorrow will not happen anymore with Torch Boots Mod. With a straightforward and creative idea, the author has created a couple of boots shaped as two torches. Its feature is to automatically lighten in the ground when you run (sprint, not go jogging). 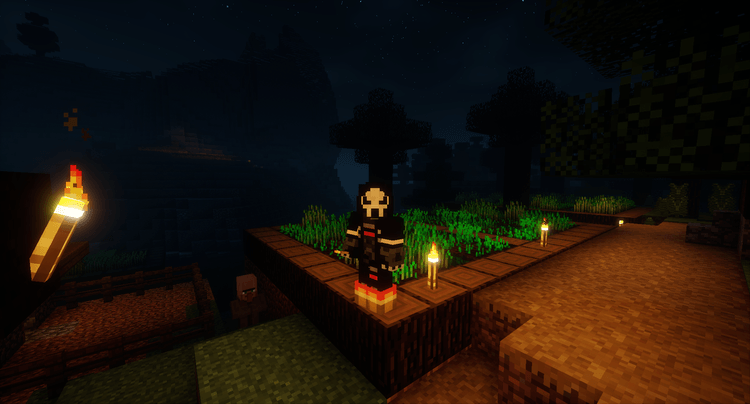 How to use: Wearing a couple of boots to your legs and remember to put some torches in your inventory (because this boots only work to put the light on the ground, it does not grow torch) and then run fast. After that, every few steps, a flashlight will be under the ground. Torch boots will work until you put all the lights in the inventory. This simple mod does not have much features, you can download the latest versions and install in the following instruction. Put jar file of Torch-Boots into mods folder and then run Minecraft. Done!